Perusahaan Umum Lembaga Kantor Berita Nasional Antara - Perum LKBN Antara or widely known as "ANTARA News Agency (ANTARA)" a long standing Indonesian state-owned mass media company and is fully-owned by the Government of Indonesia. ANTARA was fisrt established in 1937 s Naamloze Vennootschap (NV) Kantor Berita Antara or NV Kantor Berita Antara. In 1962, NV Kantor Berita Antara became official National News Agency in 1962 under the Presidential decree no 307 of 1962. The name of Perusahaan Umum Lembaga Kantor Berita Nasional officially launched in 2007. 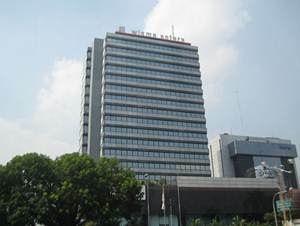 ANTARA is the national news agency of Indonesia. ANTARA is a suppliers of news and photo reports to the many media companies in both Indonesia and abroad. ANTARA also provides other supporting products and services such as data services and money and stock market information (Indonesia Market Quote/IMQ), the dissemination of the press release (PRWire) and journalism education (Lembaga Pendidikan Jurnalistik ANTARA). Headquartered in Jakarta, ANTARA now supported 23 domestic networks and 6 overseas bureaus. ANTARA's overseas bureaus located at Kuala Lumpur, Canberra, Beijing, Tokyo, London, and New York. The Company also supported by 2 subsidiaries; PT Antar Kencana Utama Estate Ltd and PT IMQ Multimedia Utama. In term of financial positions, ANTARA reached significant performance in 2014. Perum LKBN Antara reported total net profit of Rp 8.4 billion in 2014 as compared with a loss of Rp 3 billion in 2013. ANTARA booked total revenue of Rp 232.9 billion in 2014 or 29.95% growth from Rp 184.9 billion in 2013. This figures was quoted by JobsCDC.com from the Indonesian State-Owned Companies profile issued by the Ministry of State-Owned Enterprises of Republic Indonesia. Male, age around 22-26 years old. Minimum Bachelor Degree (S1) in Informatics Engineering and Computer Engineering. Able to work under pressure and good character. Capable of and have good knowledge about Solaris, Unix and Linux. A good personality, honest, initiative / good analytical and able to under pressure. Have a good understanding about System Protocol TCP / IP. Mastering the concept of implementation of routing both LAN and WAN. Mastering the LINUX-based operating system and Cisco. Have a good understanding about network security aspects. Able to perform analysis and troubleshooting the network. Mastering the system security and troubleshooting UNIX system. Have a good understanding about the concept of virtual machine (VMware). Have a good understanding about Web Server, Proxy Server, Radius System. Have a good understanding about the concept of Domain Name Service. Have a good understanding about the concept of Mail Server (MUA, MTA, SMTO). Male, age < 26 years old. Preferably Bachelor Degree (S1) in Psycholoy. Have a good understanding about psychology scoring tools. Able communicate with all levels of employees. Able to work proactively and initiative. Able to work under pressure and good behavior. JobsCDC.com now available on android device. Download now on Google Play here. Please be aware of recruitment fraud. The entire stage of this selection process is free of charge. Perum LKBN Antara - Network Engineer, Human Resource Staff ANTARA September 2016 will never ask for fees or upfront payments for any purposes during the recruitment process such as transportation and accommodation.